Feed systems 36” parts feeders orient a wide range of cap sizes and types as well as small jars, containers, and various parts with its patented smooth and gentle operation. 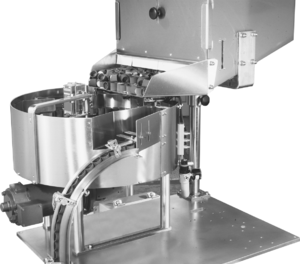 Feed Systems Model FSRF-36 Stainless steel Patented Rotary Cap Feeder utilizes a minimal amount of air to assist in orientation. Parts are to be oriented in an open side up position. Stainless steel construction, fully adjustable from 13mm diameter to 120mm diameter for all flat caps, or similar parts where the diameter is greater than the height, quite operation, no change parts, no skilled personnel required, clockwise rotation, two year guarantee, DC motor with speed controls.